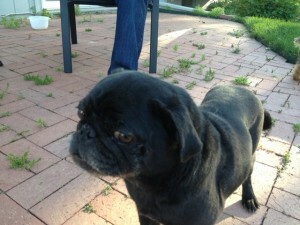 Mango is a fun loving active pug with lots of heart! His long legs make him a strong playmate. He loves to be outside and go for walks! Not much of a snuggler YET! He just started to let his foster mom rub his belly. Smart and funny, he is eager to learn tricks and the correct manners. A little “ruff” around the edges but just wants love and attention. Good with older kids and other dogs! Not 100% potty trained but its only bc he doesn’t want to be without you! He comes with a bed and his Mr Frog soft toy which he likes to play catch with.